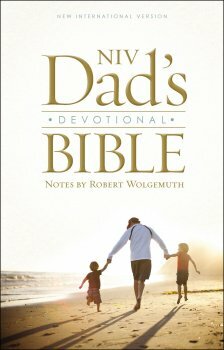 Zondervan and Robert Wolgemuth have published a new devotional Bible just for Dads! The NIV Dad's Devotional Bible provides a full year of weekday devotions along with other helpful study features. It is designed to help dads become the fathers that Gods wants them to be - ones who honor God, live faithfully, and love their families. My husband is always looking for solid Christian advice when parenting, so this was perfect for him. We come from families where the men in our life did not always model these principles for us and now with kids of our own, it's been up to us to figure it out. This Bible is well designed, while the devotions are easy to read and easy to relate to. It provides solid advice in addition to the Word. The"Building Your Children" articles and "Questions Kids Ask" index are handy and resourceful. We felt as though this bible can equip dads with the tools they need to be great fathers and leave a great legacy for generations to come. This would make a great gift to any dad or dad-to-be.